Maria used to be in Northridge, at Tampa and Rinaldi. Then she moved to Devonshire and Reseda. Then she moved to Granada Hills. And I have followed her each time, like a dog at her heels. That's because Maria understands me, and she understands my hair. I'd like to think that my psychic waves of need drew her closer and closer to Granada Hills, but I know I'm not the only person who can't bear to imagine a world without her. Just a few weeks ago, a woman came up to me at the gym and said, "I love your hair -- who cuts it for you?" "Maria Milanes," I said, and a third woman who'd overheard us exclaimed, "Maria does my hair too!" "Wow!" I said. And then, the three of us just stood together silently, in a moment of quiet reverence. "Did you just get your hair cut?" a friend of mine asked at a party. "Um, four months ago," I answered. "This is that same haircut!?" she replied in awe. "Wow, that's the mark of a good hairstylist. It even looks good growing out." "Yeah," I said. Another moment of silent awe. Over the ten plus years she's cut my hair, has Maria given me cuts I didn't like? Sure. At first. But over time, I'd eventually realize, it wasn't her, it was me. Sometimes, it takes a while for us hair mortals to understand the workings of the gods. Maria works in mysterious ways. But the best thing about her is that she listens. When you say a hair prayer, Maria is always listening. If I'm using a lot supernatural metaphors, it's because I see Maria as a somewhat saintly being. It's my personal theory that she channels the power of her purity into her art. But of course if you asked Maria, she wouldn't put it that way; she would just say that she's highly dedicated to her work. And she is. 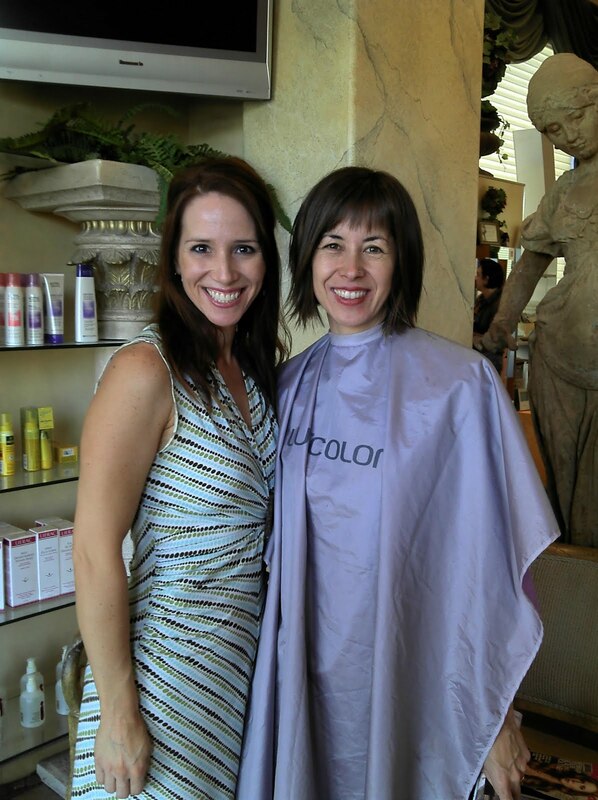 Maria is always traveling the world to go to hair seminars, to stay current in her education. Toni & Guy in London. Loreal in Paris. Jacques Dessange in New York. Vidal Sassoon in Los Angeles. The lord helps those that help themselves. Maria has cut my hair for most of my adult life -- at least the portion of my adult life during which I've had good hair, which has been the last decade or so. She's dyed it stop-sign red, chopped it high, left it long, and done everything in between. If I'm going to a wedding or any big fancy occasion, I'm going to Maria. And when I'm an old lady and I've switched over to a permanent wave bouffant (all old ladies have to wear permanent wave bouffants, don't they? ), I know Maria will still be watching over me, as young and beautiful as ever, wielding her blow dryer, harnessing the power of the mighty winds to do her bidding. You have great hair too. However, I'll glad put my Granada Hills hairdresser up against yours and they should have a "Cut off"! Go Kristine Graham!! Oh, and I forgot to add. Even when we're old ladies, we won't be doing old-lady perms. It's simply not in our nature.